Our Earth Steward program recognizes exceptional Athens Services employees and clients who have taken unique steps to reduce their environmental impact. Our current Earth Steward is an Athens employee who created a sustainable lawn and edible garden at their home. She removed her 1,600 sq. 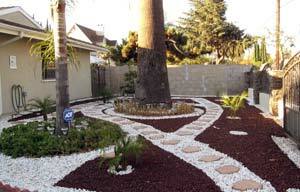 ft. front lawn and sprinkler system in exchange for a more eco-friendly and water-wise choice. With her new system in place, her water usage and bill decreased by over half! Over the course of 30 days, she completely transformed her front lawn for the price of $1,200… which is nearly half of what she was quoted just to put in new grass alone. What steps did you take to make your property more sustainable? Keep an eye out for future stories about how Athens employees and clients are being exceptional stewards of the environment. Or, if you have a story of your own, contact us!